Here is my second “three quotes in three days” quote. I don’t really know any inspirational quotes, so here’s one of my favourites from one of my favourite authors. 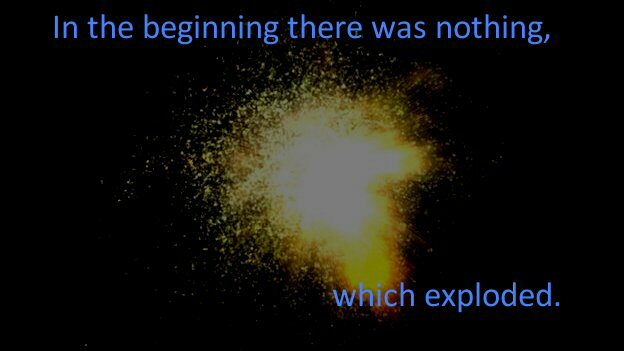 This is from “Lords and Ladies”, by Terry Pratchett and describes the “Big Bang”. The image (which I’ve altered a little bit) is from bbc.co.uk. It really says it all, doesn’t it. Love it. In an action movie, even nothingness explodes. That’s the best thing about action movies. Nothing is safe! Never discuss explosions round Michael Bay. A great quote from an inspiring writer. This is one of Pratchett’s quotes which has always stuck in my mind.